Stay with me, 'cause you'll want to know more about this. All over the world, "Geocachers" have set out little "caches" full of basically worthless little trinkets, toys and treasures. They then post the lat-long of the "cache" on geocaching.com, and by using your GPS, you trek off through the woods (or sometimes just down the street) and find the cache. You sign the logbook inside, leave a trinket, take a trinket, and place the cache back where you found it for the next geocacher. This new activity mixes a couple of my favorite things...technology and the outdoors. Living in beautiful Western Oregon, there are literally 1,000s of these caches to seek out, and this "sport" is the best way I have ever found to initiate a hike and get out for some fresh air when not flying. Try it, you'll like it. But don't EVER tell your significant other that Av8rdan turned you on to Geocaching, so that when you get the bug and become addicted to this modern-day treasure hunt, I won't get a nasty phone call when you are always gone, out slogging through a mudhole in search of yet another little Tupperware box stuffed with treasures you previously could only find at the 99 cent store. Usually, finding out that the FAA plans to limit regulation on anything would be considered a good thing. So when I read today's AP story about legislation signed a year ago by President Bush that severely limits how the FAA regulates the fledgling Commercial Space Travel (CST) industry, I’d have to say YEA, this is cool. From the AP story: Some other safety-related rules cannot by law be issued for eight years unless specific design features or operating practices are brought into question as a result of an incident causing serious injuries or a fatality. Is it really wise to implement a “wait and see” approach to CST accidents? The FAA’s Office of Commercial Space Transportation is taking CST seriously, with everything you would ever need to know about the industry found here. The official FAA Notice of Proposed Rulemaking PDF can be downloaded here. Pilots, meanwhile, must have an FAA pilot certificate and be able to show that they know how to operate the vehicle. Student or sport pilot licenses would not qualify. Duh! This is a tough one. I am a huge Burt Rutan fan, and as the guy out there on the cutting edge of CST, I firmly believe the guy knows what he is doing. But it is not Rutan I am worried about. I’d like to see the FAA keep an eye on JimBob’s Space Tours out in Padukah, the guys who you just KNOW will try to strap a million M-80s to a double-wide so they can attempt to launch a load of dimwits into orbit from the local Wal•Mart parking lot. Tecnam Aircraft of Italy is planning to offer a fully FAA certified light twin, with deliveries expected to begin in late 2006 or 2007. What is interesting about this announcement is Tecnam’s choice of power for their new creation, dubbed the P2006T – 100HP Rotax 912 engines. From Tecnam: The new P2006T will feature retractable undercarriage, hydraulic constant speed propellers with feathering and a full IFR Glass Cockpit option. Predicted performance figures for the P2006T include a 75% cruise speed of 147 knots, 53 knot stall, a rate-of-climb of 1,400 ft/min (with single-engine ROC of 350 ft/min), an empty weight of only 630 kg, and a useful load of 460 kg for a maximum all-up weight of 1,090 kg. Pricing is said to be in the $273,905 – $285,814 range. There was a time long ago when I would not have given Rotax engines the time of day…but not anymore. They have evolved into a fully certified, legitamate choice for light airplane power, and I can see a decent market for the P2006T from flight schools who give multi-engine training. What is WRONG with the mainstream media? I can guarantee you that yesterday, an SUV rolled over somewhere in America, and three people suffered fatal injuries. Tragic as that is, AP failed to pick up the story and run with it on their National wire. OMAHA, Neb. - A small plane crashed into a field, killing all three people aboard, officials said Thursday. The wreckage was spotted by a utility worker shortly before 10 a.m. Thursday about a mile south of the Millard Airport. Dense fog blanketed the area at the time. This kind of treatment towards GA will never, ever cease to amaze me. This is why your neighbor thinks those "little airplanes" are so dangerous, as they jump into their Geo Metro and race off down I-70, happy in their belief that somehow, they are safer fighting semi-trucks for position than riding in an impeccably-maintained V35 Bonanza with Flight Following watching out for traffic. On a recent vote – and by a slim margin of 3,001 out of 6,000 union members – Delta’s pilots have again agreed to take a 14 percent pay cut to keep their line afloat while the bananas in the front office try to stay out of bankruptcy court. This comes on the heels of a 32.5 percent pay cut deal over five years approved in 2004. The pay cut reported today reduces the average Delta hand’s salary from $170,000 to $146,000. As a coach passenger, I wonder how long the big three – American, Delta and United – can hang on. I'm considered by some to be quite business savvy, and have helped guide my business to solid growth in all of our six years. I say this because it is hard for me to understand how lines like Jetblue, Southwest and AirTran can make money, while the big three bleeds serious red ink on a daily basis. Discussing the business models of the legacy carriers vs. the “low cost” carriers would take far more space than allocated here. I am convinced however that it must be something other than union wages that is causing the Big Three to flounder. If I were a betting man, I’d throw my coin on the causes being a “Dilbert” mentality and style of management at the top. It is no secret that major U.S. corporations are top-heavy when it comes to managers making too much for running under-performing companies. Again, I bring up the Costco model and Jim Senegal – the most humble CEO on Earth – who makes only $360,000 and runs a tight ship that makes gobs of money. I worry about the future of commercial aviation, and wonder how we as GA pilots can interest our youth into embarking on a journey down the road to an airliner’s left seat when the legacy carriers struggle to survive. Yes, $146K is still serious money, but will that matter if the Bigs can no longer operate without Federal subsidies, like the current Amtrak model? We know that is a train wreck waiting to happen, pun intended. As the quality of commercial coach travel deteriorates, there is, however, a huge upside. Business aviation and its related industries is in the midst of a huge boom right now. I have one client selling Pilatus PC-12s as fast as they can fly them over here from Switzerland. When the VLJs hit the airspace soon, look for pressure to be applied on the Bigs to somehow trim management, improve service, and slash prices to match the low cost guys. Do this, and they survive. Business as usual, and it may be a great time to invest in the numerous upstart air taxi operations who have standing, paid orders for hundreds of economical VLJs waiting to change the air carrier playing field as we know it. Do you really want to share the sky with these? 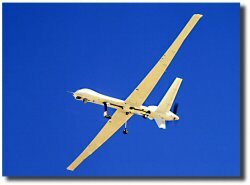 Is using unmanned aerial vehicles (UAVs) to patrol the U.S. border with Mexico a good idea? Some in Congress, the U.S. Border Patrol and at Homeland Security say yes, but AOPA questions their logic in a great article found here. AOPA has also opposed creating restrictive airspace for UAV operations. A 15 nautical mile-wide TFR along the U.S. southern border, for example, would impact more than 100 airports, more than 1,300 based aircraft, and nearly 750,000 annual general aviation flight operations. One UAV requires a crew of up to 20 support personnel. The Hermes UAV, for example, costs $1,351 per flight hour to operate. A Cessna 182 with pilot would be about $200 an hour. Andy Cebula, AOPA senior vice president of government and technical affairs, is their point man in this issue. As always, AOPA is on top of yet another very important problem facing GA, and as always, I am proud to be a member of such a vital organization. She is the answer to the trivia question I have been throwing around the past few days. Jerrie was the first woman to fly solo around the world, and if you have never heard of her, you are not alone. She is shown at right standing next to her airplane, the Spirit of Columbus, which is back on display at the National Air and Space Museum's Steven Udvar-Hazy Center in Chantilly, VA.
For some good background, read this article, or visit my other blog. Here is the fourth of five clues to a trivia question I will answer on December 26. Then, I'll reveal the names of anyone who emails me with the name of the person in question. Clue #4: She received the highest medal of recognition for aviation accomplishments from both the United States and France for her 23, 206 statue mile flight. (Hint: Her route never crossed into French airspace, but she did stop over in Casablanca and Bone, Algeria, where French was spoken). Email me HERE if you know the answer. Here is the third of five clues to a trivia question I will answer on December 26. Then, I'll reveal the names of anyone who emails me with the name of the person in question. 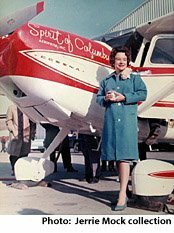 Clue #3: She (yes, this mystery person is female) departed Port Columbus Airport on March 19, 1964, and was being challenged by Joan Merriam Smith trying to complete the mission Amelia Earhart was attempting when Earhart and navigator Fred Noonan disapperaed in the South Pacific. Anybody who has spent five minutes with me knows that the DC-3 is Av8rdan’s all-time favorite aircraft. This is the plane that reinvented commercial aviation as we know it today. To celebrate the –3’s 70th anniversary (this past December 17th), I thought my readers would like to know about Basler Turbo Conversions of Oshkosh, WI., the company that transforms the Gooney into the BT-67, an awesome, versatile and beautiful machine. I toured a BT-67 while at Airventure a few years ago, and was floored at the craftsmanship of the Basler conversion. 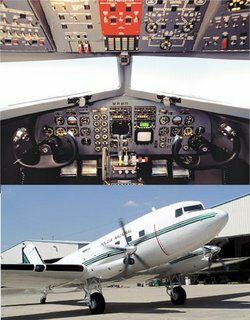 They trash the old radials and hang a pair of new Pratt & Whitney PT6A-67R turboprops, while replacing the panel’s tired steam gauges with the very latest avionics. The Basler crew turns a DC-3 carcass into a brand new animal, one that is now in use around the world. With its increased performance, the BT-67 is perfect for chasing drug lords in Columbia, fighting fires in Wyoming, or hauling food into African villages. It would also do me just fine as a personal party plane. A dozen of my budds and a flight plan to Vegas…now that is flying! FYI, the guys at the DC-3 Museum in Corvallis, Oregon could use a hand. Check out their website here. Here is the second of five clues to a trivia question I will answer on December 26. Then, I'll reveal the names of anyone who emails me with the name of the person in question. Clue #2: This person's airplane is on display at the National Air and Space Museum's Steven Udvar-Hazy Center at Dulles Airport in Chantilly, VA. (Hint) It's the Spirit, but not of St. Louis. Wouldn't it be cool if you could dial up one phone number on your cell phone while pre-flighting your plane, and hear a recording of any AWOS in the land? A year ago, this would have been something only found in Fantasy Land. Not so any more. A free service called AnyAwos has been in place long enough for me to now endorse them, as I must admit the idea seemed so far fetched at first, I thought it could not possibly last. But by dialing 1.877.ANY.AWOS (or to the telepad challenged, 1.877.269.2967), you can punch in a few letters and after one quick prompt, you are listening to real-time AWOS. No need to store all your favorite destinations into the cell's speed dial, just one number is all you need. I am not affiliated with them, but I do use the service and it works. It is fast, effecient, and since they also offer a paid "premium" service where you can get 5 AWOS reports on one call, I hope these folks are raking it in. Today, I begin to offer clues to a question I believe every one of my readers will find both amusing and educational. This is the first of five clues, and on December 26, I'll reveal the answer and the names of anyone who emails me with the name of the person in question. Oh, and no fair cheating and Googling this person to achieve superiority...I'm looking for those aviation historians who can name this person from their own personal knowledge database, without having to look anything up on the www. Clue #1: This person flew a basically stock 1953 Cessna 180 Skywagon 23, 206 miles solo to become the first pilot to accomplish this pioneering feat. The government spin machine is alive and well tonight with their annual press releases meant to entertain the public as we approach the night of December 25th. On that night, a Jolly old guy, flying fat dumb and happy, will attempt millions of approaches to tiny rooftop landing zones, many of which will be blind shots through deteriorating instrument meteorological conditions (IMC) onto compromised high-pitched “runways”…many covered in snow and ice. The sleigh has been outfitted with new, state-of-the-art navigational equipment, including an Enhanced Ground Proximity Warning System, a Traffic Alert and Collision Avoidance System transponder, and a Global Positioning System with FAA enhancements that allow Claus to pinpoint his exact location with one meter. The improvement is expected to assure Claus that he won't land by mistake at "the houses of children who have been naughty, not nice. I know, I know, this is all in good fun. But do we really need these “official” releases “assuring” the public that Santa’s deliver system will not result in dead reindeer on their roof, at a time of heighten security? Seems there is a long-time poster to the Avsim.com forums who happens to enjoy the exact same name as myself. He is a flight simulator guy that is also into photography, and I suspect that if I were to investigate further, the similarities would not end there. I was completely unaware of him, and he of me...but I'm sure we all can co-exist for the good of aviation. So if you see our two names bouncing around cyberspace, I go by Dan or Av8rdan, and he goes by Daniel. Ought to clear things up. 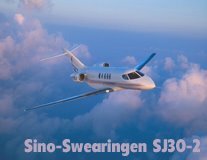 For sheer jet-powered excitement, how can you go wrong with the awesome new Sino-Swearingen SJ30-2? Yeah, I guess 560 MPH ought to get ‘er done. Of course, who can afford one? So – still dreaming – I’d love a Lancair IV-P Propjet. This kit blasts through the sky at 370 MPH, and gets a solo pilot up to FL240 in pressurized comfort at 7,000 FPM! O.K., to get a bit more real, the SR22 GTS is a real plane I can conceivable own someday if my aviation ad agency picks up the right national clients. Fast, beautiful and, well, it’s a Cirrus, what more needs to be said? For vintage fun, it would have to be a DC-3, and you can find one of the best examples of the 1,200 or so still flying by looking at Duggy, the coolest Gooney of them all. You can also buy your Duggy gear here. Now, on to reality. Chances are, you’ll see me owning a used Grumman AA5B Tiger in the near future. For about $70 grand, it has Skylane speed, Skyhawk-priced annuals and insurance costs, and it handles like a poor man’s RV-8. And, you’ve got to love the sliding canopy, unless it is raining. Smart Tiger owners carry a beach towel for cheap but effective avionics protection when the wet stuff is falling. Anyone who flies flight simulators is OK in my book, so welcome to the blog and make sure you come back whenever you need a break from work, life or thinking terribly hard. World of Flying is like flying a Cessna 172 in either MS Flight Simulator or X-Plane, it requires no serious work, is quite enjoyable, and can be a lot of fun. I am a huge proponent of consumer sims as a valuable tool to teach real pilots the basics of navigation, communication, scanning the panel, and even airmanship. They also shine for pilots like myself who choke at the $111/wet hour rental rates for a Cessna 172XP at KEUG and want to stay fairly current in between real monthly flights. Right now I am running back and forth in a King Air 350 from Eugene, OR to PDX in Portland, shooting the ILS into 28R in real-time weather conditions. While the FS or XP environment is not exactly the same as seat-of-the-pants flying, it is damn close these days. Take a zero time kid and teach them on FS or XP for 50 hours and them immerse them in ground school and real flight training, and I'll bet the farm he or she will ace their written, smoke their oral, and knock the socks off their FAA Pilot Examiner. I will never forget the day I visited Bob Lock’s shop just outside Reedley, CA. He was hand-building one of two New Standard D-25 biplanes he would later use in his new venture, Waldo Wright’s Flying Service. The visit brought back memories from my ‘tween years when I attempted to build a few large scale model aircraft. Trust me when I tell you it would NOT have been safe to have ever flown in any of my questionable designs. So to watch a master craftsman like Lock meticulously bending wing ribs one at a time out of wood blew me away. He was building a functioning, flyable full scale airplane as if it were a model – the only difference being that he would have to somehow convince the FAA (and his insurance carrier) that his workmanship was sufficient to haul paying passengers around without the wings falling off. Anyone who has ever known Lock or his son and business partner, Rob, know these are two guys who are valuable assets to our aviation community. Nobody has the passion for vintage biplanes as the Locks, and it shows in the airplanes they build. And it is an honor to be able to say I know the guys who have now built the nation’s largest vintage biplane ride company. So do yourself a favor and visit their website, and keep an eye out for the Locks flying their D-25s and Stearman Oct-May off the lush grass strip at Kermit Weeks’ Fantasy of Flight Museum in Polk City, Florida. How could anyone dispute the claim that Burt Rutan is our time’s most prolific aircraft designer? The story of his life proves he is the King of thinking outside the aerospace box, and when you look at the list of flying machines his fertile mind has created, you start to wonder if this guy ever sleeps. In short, he said that historically, aviation has seen a major design development about every 25-30 years or so. After the Wright’s started the ball rolling in 1903, the invention of the DC-3 in the 30s gave birth to commercial aviation as we know it. 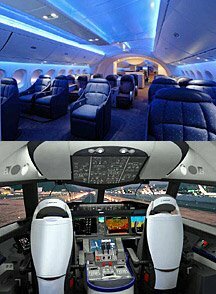 Aviation technology again leaped ahead in the 50’s with jet airliners, and again in the 70s with the debut of the Boeing 747. According to Rutan, the Concorde was supposed to be the “next big thing”, but that did not come to pass. Therefore, he says aviation is overdue for the next leap, and he is happy to report that private space travel will be the result. He and Sir Richard Branson are on the cutting edge of developing space airliners that will change everything in our aviation world. It is hard to find a more interesting person in aviation right now than Burt Rutan. I invite you to visit his Scaled Composites website and learn more about a guy who I believe would have really fascinated Orville and Wilbur Wright. Any good pilot knows considerably more about the weather than the non-flying public. I am no different, with WX bookmarks making up well over 50% of my Firefox bookmarks. There are many lesser-known weather "products" out there that can help a pilot put the big picture together in their mind before they call FAA for their standard briefing. One of these secrets has always been the NWS "Forecast Discussions" – which are official communications between weather stations where each forecaster gives his or her official best guess of what's happening in their neck o' the woods. These reports help each station compare notes as they put together the media reports that we hear on the six o'clock news. FDs are not worded for public consumption, in fact there is enough weather-ese to make this often resemble Chin-ese. But with a little practice, any licensed or student pilot will pick up a considerable amount of very VERY useful 411. I use these FDs as my secret weapon, and they are ALWAYS spot on accurate. Up until now, FDs gave the reader a look at everything BUT aviation weather, and the studious pilot had to read between the lines to see how what the NWS guys were saying would effect their route of flight. But that has thankfully changed. Now, each FD features a block of "aviation" copy phrased strictly for pilots. AVIATION..FREEZING RAIN WILL MAKE CONDITIONS AT KRBG HAZARDOUS THROUGH ABOUT 18Z. MVFR CONDITIONS AT THE COAST THIS MORNING. 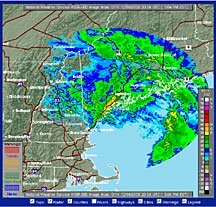 CONDITIONS WORSENING ACROSS THE FORECAST AREA AS A STRONG STORM MOVES THROUGH THE REGION. STRONG AND GUSTY LOW LEVEL WINDS MOST AERODROMES. HIGHER TERRAIN WILL BE OBSCURED BY LOW CLOUDS AND A MIX OF RAIN AND SNOW. This is awesome. NWS/NOAA has gone live with a new set of WSR-88D NEXRAD sites that include topographical elements, cities, roads etc. with the radar returns. Check it our here. That’s the first possible delivery date available to pick up your brand new Eclipse 500 Very Light Jet. Think it’s crazy to wait that long to drop just over a million on a VLJ? Apparently, the people who just secured those coveted May, ’08 E-500 positions don’t think so – they are literally throwing money at Eclipse Aviation. The flood of VLJ deliveries set to begin in 2006 will redefine general aviation as we know it. 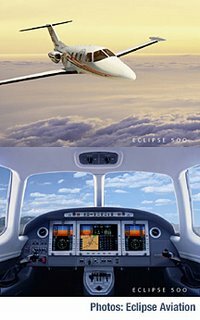 Set to begin arriving at an airport near you along with the Eclipse is the Cessna Mustang, Raytheon’s Premier, the Adam Jet, the D-Jet, maybe even a Honda Jet, a few ATG Javelins, and a handful of others. To contemplate what all these new VLJs will do to the airspace we fly in, we also have to factor in another new crop that is sprouting as we speak…Light Sport Aircraft. With their small size and slower cruise speeds, they are in marked contrast to the VLJs, with the two classes living at opposite ends of the flight envelope. High and fast, low and slow. VLJs, LSAs, and ATC, how will it all fit together? Hopefully, all the VLJ drivers will be on IFR flights, and with the high-end training required to keep their insurance guys happy, they will simply flow through the system without causing much of a ruckus. But throw a bunch of modern day Piper J3s dinking along well below the speed of sound into the mix, and it is safe to assume that busy GA airports will get much busier. FAA and ATC has their assignment – keep the composite, the aluminum, the tin and the fabric from becoming a messy NTSB statistic. The next two years also brings a new assignment for every licensed pilot, SEE AND AVOID! We should all begin today to practice extra vigilance in the pattern, to prepare for that day we all know is coming, when Mr. Big in his phat new ATG Javelin and Poe-dunk Bob in his LSA puddle jumper both want to occupy the very space where your airplane currently resides. Head on a swivel, guys…sterile cockpit time…don’t bother me, I’m landing. Is the timing right on this? As airports begin to jam with holiday travelers in a few days, the TSA will be right in the midst of an important change to the post 9/11 security measures we either love or hate. Beginning December 22, scissors with a cutting edge of four inches or less and tools such as screwdrivers, wrenches and pliers smaller than seven inches will be permitted on board. Scissors longer than four inches and tools such as crowbars, drills, hammers, and saws will continue to be prohibited from carry-on bags. So a pair of scissors with a cutting edge of four inches will be permitted? What am I missing here? The razor knives that caused the most damage on 9/11 had blades just one inch long. I’ve actually caused myself to bleed from flailing around with small office scissors while fighting a paste-up deadline. Running with scissors is taboo, unless Little Suzy wants to run down the jetway, then it is cool, so says TSA. I support vigilant airport security in theory, but for my two cents, I think this is a mistake. And the timing is awful…why couldn’t they wait for the middle of cold, snowy January to implement this change? Recently, a good friend of mine, Lee Hansen, passed away unexpectedly at a young age. Pilots in Central California and on the Victor airways heading to Redding will remember Lee and his amazing wife Valli as "Bonanza 888 November Echo". Five minutes into Lee's funeral, a twin flew over Sanger Cemetary (looked like a Baron 58, so Lee would have been glad it was a Beechcraft), and about half the 200 heads in attendance ratcheted upwards to – you guessed it – watch the twin fly out of sight. We pilots are all the same. Today, I posted this blog as my way of staying as active as I can in aviation, because you never really know when YOUR number is going to be punched and you'll get called up to go fly with Lindbergh. That is why I am urging everyone who has ever thought about taking flying lessons to do one thing tomorrow: Call your local flight school and book a discovery flight. Why wait? You can search Airnav to find the school nearest you. I’ve recently upgraded to the latest, greatest X-plane, which has a plug-in you can download and install that lets you fly online with other X-plane flyers. Everyone can see all the planes in real-time, but wait, it gets better. When you login, you have to claim an N number (I am N758 Gulf Bravo, just like the 172 XP I really fly) and there are actually guys out there who are playing Air Traffic Control...and “talk” to the X-plane pilots via text messaging on screen. On my first simulated flight a few nights ago, it was only me and “Los Angeles Center”. He assigned me a frequency, and we “talked” while he helped me learn by assigning me vectors and altitudes around the LA basin. Pretty awesome stuff. But wait, it gets better still. These X-plane flyers actually organize “fly-ins” and post the info about them in the X-plane.org forums. So then a bunch of guys go and “stage” their plane on the ramp at that airport, and one by one, ATC clears them for takeoff and they fly with the others to a different airport and then they set up in the pattern and land…all the while “talking” to ATC. Anyway, I ended my first session with LA Center by completely blowing the runway end at KBUR (Burbank) while landing in my King Air 350. The police, fire and press all showed up (not really) because I squished a Volkswagen beetle full of nuns (not really). Next generation Cirrus: Bet on a propjet. Right now, Cirrus Aircraft is the top selling GA plane out there. Their SR22 GTS/G2 is almost beyond anything a GA pilot would have wished for a decade ago. Yes I want one...bad. But there have been rumors floating around that Alan Klapmeier and Cirrus are developing some sort of new model, one that will "blow away" even their current models. Interviews with Alan K. in the aviation press have not shed light on what this new model will be, but I have my money on a turboprop version of their SR22. If this sounds like a pretty far out idea, keep in mind that Cirrus has history in the turboprop department. The photo at left is of an old pusher design they built in 1994, but don't expect a new design from them to be anything like the St50. A few forward thinking optimists say it will be a turbofan-powered VLJ to compete head to head with Cessna's Mustang and the Eclipse 500. But don't hold your breath on that, because Cirrus already has a very capable airframe, and to manufacture a pressurized true jet would force them to re-invent the wheel. Won't happen. The Cirrus website says they even have a few 2005 delivery spots still open. Julie, where's the checkbook? It is no secret I am AOPA's biggest fan here in the Pacific Northwest. Where would GA be without them fighting for us in Washington, DC? If you need to turn a non-pilot on to the excitement that surrounds GA, aim them at this incredible AOPA site. You may also tell them to watch these new AOPA TV spots: broadband | dialup. Find out all you need to know about AOPA's latest news here. And if you want to join AOPA, click here. 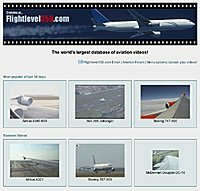 I discovered this aviation site a few days ago. It features an extensive collection of aviation videos. Some are just mundane airliner landings, but others are really awesome and wild footage of commercial and GA planes doing their best to amaze you. Tip: click on “Most popular of all time” link on left to quickly get to the good stuff. Oh, and if you have dial-up, sorry, disregard this post. For those of you who know me, it is no secret I love airplanes, flying, and anything even remotely related to aviation. That should come as no surprise to anyone who knows a pilot, since we are all the same. A Piper Cub flies by overhead, and we pilots stop our conversation to stare in complete amazement until that little plane eclipses the horizon. We meet another pilot at a party, and for the rest of the night, you can be assured that the two aviators will be lost in their own world, with the topic of conversation undoubtedly being, you guessed it, airplanes. I have been a nationally-published writer since 1979, with my most recent work being picked up in AOPA Pilot, Aviation for Women, and Inflight USA. 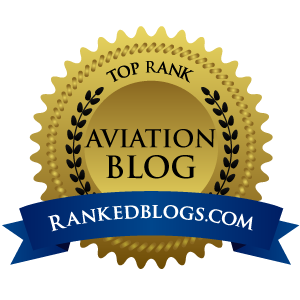 I simply LOVE to write about aviation, and starting this blog seems like the right way to let loose with some less formal musings about a subject we all love. I read several other blogs each day, and believe strongly that the “blogosphere” has an important place in our society. So sit back, enjoy whatever comes you way via Av8rdan's World of Flying, and check back often. I plan to update frequently with news, views, a little craziness, all served with a fresh dose of my own brand of humor and schlock.